The wall shakes again, citizens on the other side knowing they should be running but too scared to move. A crashing of rock and dust and a hole appears. The wall has been breached and danger is pouring in. The citizens have been shaken from their shock and are running, but many of them won’t escape. They’ll end up dinner, swallowed whole or brutally bitten in half by the terrifyingly malformed, naked, grinning Titans — massive beasts that seem to only exist to terrorize and devour humanity. With one look directly into the camera, there’s a rush of nightmares that only the eerie Titans can provide. Attack on Titan began as a manga series in 2009, before having an anime adaptation released in 2013 and a number of spinoff novels and shows. Its popularity is widespread and this most recent video game adaptation isn’t the first attempt to let gamers battle the Titans. 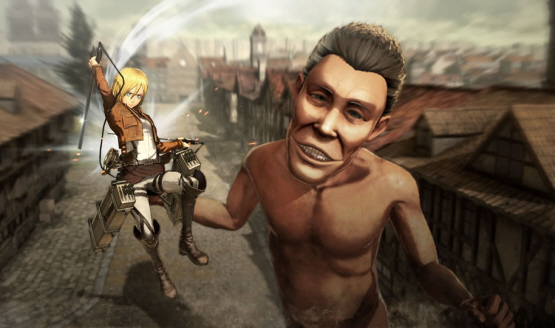 Fortunately, this Attack on Titan is not related to the 2013 disaster that released on 3DS. There’s always a concern when releasing a licensed product, a question of if it will do the franchise justice, if it will adequately retell the stories, and if it will deviate too far from the source material. Can it relay the narrative without relying on players having previous knowledge of the source? Attack on Titan reaches into both the anime and manga for inspiration, and somehow comes away with something that’s complimentary of both, yet stands on its own as a narrative piece of the franchise. Even if you’ve never seen an episode of the anime or perused a page of the manga, you can get a full understanding of the characters and stories being told, which is already an impressive feat for a licensed product. 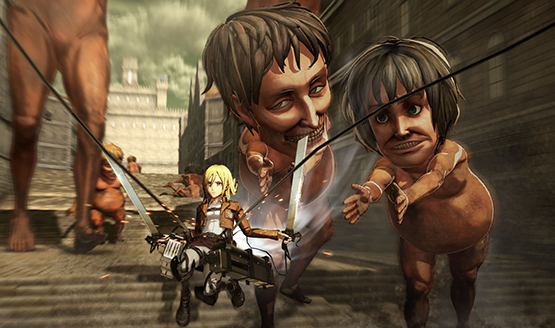 The story allows you to play as multiple characters including Eren, Mikasa, Armin, and Levi, each with their own unique abilities that make taking on Titans a little bit of a different experience depending on which. Is it fun to play though? Or would you be better off gripping a potato while watching the anime just to get the story? Besides the bizarre allure of the massive Titans (seriously, I can’t look away from the ill-proportioned naked man babies and their eerie forever smiles as they chomp down on humans with their rows of tiny teeth), Attack on Titan is fascinating for its portrayal of humanity’s ability to overcome the Titans’ size using specially designed blades and something called the 3D maneuverability system, which allows soldiers to zip through the air using pressurized gas canisters and tension cables. It’s something very fitting for an anime, but the task of translating this complex battle system to a player controllable environment seems monumental…one might say titan even. Omega Force deftly culled those concerns while creating a movement and battle system that is not only fun, but also pretty simple to pick up and learn. The square button will launch the cables, and using the left analog stick controls each character’s direction in midair. Hitting R1 when near a Titan starts up combat mode, where square attaches to the Titan, preparing your character to fly in and perform attacks on their limbs and lethal weak point, the nape of the neck. All of these controls are completely map-able in game too, so you can swap out any button for any command. The controls feel fluid and intuitive, and after a brief time getting used to the unique system, I found myself flying about each level and slaying Titans with ease. One of the coolest little details is that the cables will always attach to a physical object instead of just appearing the shoot off into nowhere. The angle of attachment also affects movement through the level. What is fun isn’t always perfect though, and Attack on Titan does have its faults. The extremely fluid movement and battle system does mean that the camera likes to get stuck if you drop down into roads between houses, or get tangled up in a close group of two or more Titans. Fortunately this doesn’t happen too often as the best way to take on Titans is to stay far off the ground and avoid letting one get between you and your target, so once I got the hang of the mechanics, I found the camera issues happening less and less. Attack on Titan is one of the best looking games on the PS4, and no, I’m not saying it’s going to compete with the fidelity of a game like Uncharted 4. I am most impressed with the way that the visuals have been tailored to be specifically reminiscent of styles used within the anime and manga, all while retaining fully three-dimensional gameplay and movement. 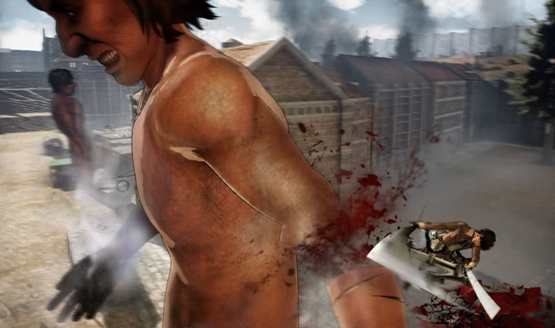 Most games based on an animated franchise fail to capture the original appeal in the move to 3D, but somehow Attack on Titan offers the best of both worlds, more or less allowing an interactive version of the anime. This is why it’s such a shame that the screen is so ridiculously cluttered by the HUD. Mission status, equipment menu, allies, map, mission cleared notifications, and often subtitles for the Japanese voice overs while playing all provide a massive border and sometimes even mask the middle of the screen. Not only does this block the visuals they’ve created, it also makes the nuance of quickly setting up strikes on Titans’ weak points more difficult than it should be. A lot of it could easily be minimized or even completely done away with to allow more screen real estate for, you know…actually playing the game. It also brings up a point about the Japanese voices in the game. While I don’t mind Japanese voices with English subtitles (and actually really prefer them most of the time), when I have to both concentrate on battling Titans and read the subtitles for my team’s conversation along with the rest of the messy HUD, it becomes very difficult to deal with. It’s hard to say what would resolve this. I’m fine not having an English dub, but the mid game conversations need to either be relegated to cutscenes or placed during lull moments where I can focus on what people are saying. As it is, I’ve gotten my wife to translate most in level subtitles for me, so I can focus on doing what I do best. There is an RPG-style progression system in the game where you can level up, get new gear, and gain loot from the battlefield to upgrade your gear, but I never found it to be an essential system to playing the game. It seems to be an added layer for an appearance of depth, but I managed just fine on upgrading the first set of gear that I bought, and never found a need to swap out gear for different stats when the stuff I had worked fine for taking down Titans, most in one or two hits once I got to the nape of the neck. It’s not a bad thing to have in the game, but I certainly would have liked to see this depth actually have more gamplay significance. Finally, what would a group of Titan killing humans be without the ability to play together? Attack on Titan does have a multiplayer mode, which I was lucky enough to be able to try out with our own Cameron Teague. Jumping into a lobby, the game put us into a camp where we could prepare our gear and select a mission. The missions play just like single-player missions, with objectives popping up on the map and requiring us to take down Titans. We tried both staying together and splitting up, and both methods worked out great. While it didn’t offer that much difference from the single player, there was something awesome about seeing a human friend just across the level killing Titans too. Attack on Titan is an excellent example of a passion project made right. It’s not a simple cash grab, but created with care for fans of the franchise and newcomers alike. It captures the precise feelings I get watching the anime without sacrificing anything for the interactive or visual experience, from the terror of the Titans to the rush of zipping through the air inches away from certain death. While it could have had a more robust RPG system and and a much cleaner HUD, these aren’t big enough issues to detract from the titan amount of fun that Attack on Titan is, each and every nape I cut. 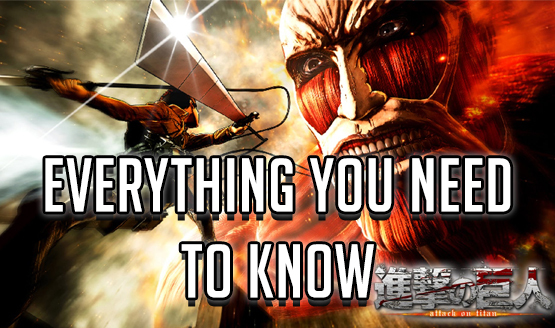 Review code for Attack on Titan provided by publisher. Reviewed on PlayStation 4. For more information on scoring, please read our Review Policy here.